The fact that these two teams have clashed in each of the past four seasons of the Euroleague indicates the consistency of both sides. There may be very few surprises for either team due to these regular meetings, there is likely to be a few changes and new additions that help to give this game a touch of freshness. One player that the Baskonia fans will be keen to see is Shane Larkin who is new to the Euroleague. He’ll have plenty of support to rely on and the home fans will be looking for Rafa Luz and Josh Akognon to help the youngster out. Rodrigue Beaubois is likely to be one of the key players for Baskonia this campaign and he’ll be looking to make his mark alongside Trevor Cooney another youngster coming though. This suggests the Spanish side are well equipped for bleeding young players but this does require the more experienced heads in the team to stand up and ensure that the kids are fully supported. Baskonia fans and players will know the Anadolu coach very well. This is because Velimir Perasovic was the Baskonia coach last season and he led the Spaniards to a Final Four appearance. Perasovic was also the Saski Baskonia coach in the 2000s and he led them to a Final Four appearance in 2006. This means there will be a lot of love and affection between the coach and his old team but this will definitely stop when the action starts. Thomas Heurtel is another player who will be very familiar to Baskonia, after all, he was the key Euroleague player for assists last season. This is going to be an intriguing match and it’ll be interesting to see if Anadolu can spring surprises or if Baskonia will know what is coming next due to the presence of very familiar players and tactics. The bookies feel that this is going to be the closest game of the night and that makes sense. Both teams are transitioning and with the away team coach coming back to his former club, there could be a stalemate of sorts. 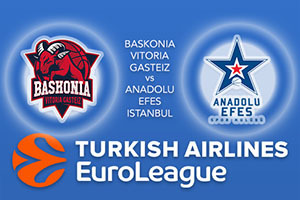 Look to take Anadolu Efes Istanbul at +3.5 which is on offer at 1.90. For the Over/Under market, go UNDER 164.0 which is provided at odds of 1.90. Bet Now!